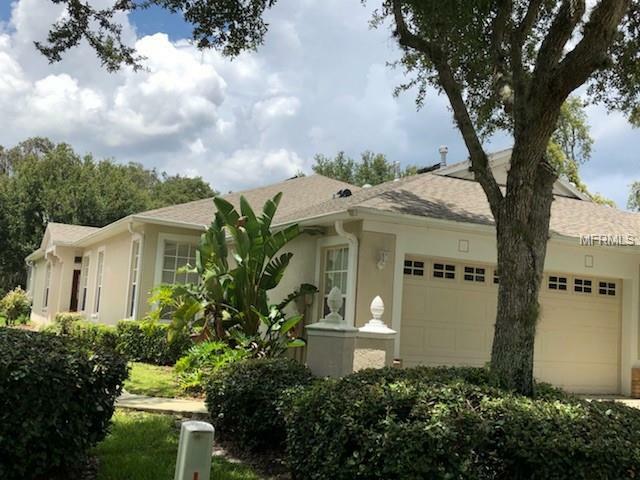 Wonderful 3 bedroom, 2 bathroom villa in the sought after privately gated village of Sandhill Place within FishHawk Ranch! This home is the perfect space for a family just starting out or even a retiree looking to downsize! This maintenance free community includes exterior upkeep, lawn care and roof; all included in your HOA fees! From the moment you arrive this home screams "MOVE-IN READY with ceramic tiles through the entire home. Home as attached two car garage makes this feel like a single family home! Inside awaits a fantastic floor plan, offering a large great room, perfect for entertaining guests and a separate dining room. The kitchen offers all wood raised panel cabinets, lots of counter space and a pantry closet. The split floor plan keeps the master bedroom secluded on one side of the home featuring tray ceiling, extended sitting area with sliding doors and an attached bathroom with dual sinks, walk-in shower, garden tub, large walk-in closet and private water closet. The second & third bedroom is on the opposite side of the home along w/ a full second bathroom. For added convenience, the laundry room is located inside and is a pass through to the garage. A large screen patio overlooks stunning conservation views! This home is move-in ready and waiting for you! Come on in and take a look!